Silver Strand Beach, 1983. Me on the left, Laura on the right. She titled this postcard “Looking Up”. My sister Laura would have been 60 years old today. She was a Thanksgiving baby (not born on Thanksgiving, but Mom was in the hospital with her on T-Day), which seems appropriate, considering that she was one of the most thankful people I have ever met. I remember her telling me how magical it was that she could be so still, because then she would sit outside under the crabapple tree and birds would land on her. She loved that. Sometimes I get mad that she had to die. But other times I think she just graduated early, like an advanced student. What an incredible spirit, which so clearly runs in the family. I feel lucky to have had her for as long as I did. She was a remarkable person. Thanks, Sarah. I always hope I don’t bring people down by talking about her. I have so many good memories. I can’t imagine losing my sister, for all of her, good and bad, though because I am the youngest by many years, it is more likely that I will face it. And I hope I can say so many kind words if that comes to be. I’m glad you have so many happy memories of your sister. Early graduation is a nice way to think of it. She moved on to the next big thing. I can’t wait til we get to go on our grad trip together. I have MS, too. It is certainly a disease that will either destroy you, or teach you to be grateful for whatever ability you have to enjoy whatever part of life you can. I choose gratitude. It will also teach you to be patient with pain, to forgive yourself for your challenges. I’m still working on those. Your sister wasn’t the only one in the family with a beautiful spirit! Thanks, Sarah, and best wishes for you as you go through the challenges of dealing with a chronic disease. I think we should all choose gratitude, but it is sometimes hard to remember. That last line is so wonderful. I have goosebumps. The picture is also lovely. I’m so glad we did those photos. 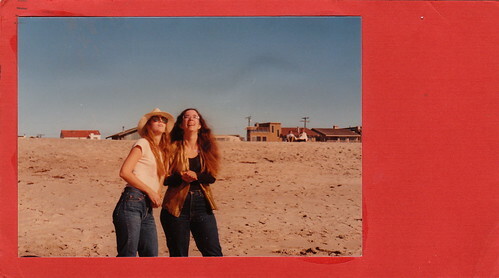 She had just moved back to California and wanted to take pictures of feeding the seagulls on the beach for Christmas cards.